It's a little hard to tell how smoky it is from this picture, until you realize that Lassen Peak, the central feature of the Lassen Volcanic Center and Lassen Volcanic National Park, should be easily visible just to the left of the distant part of the highway. Here's what this same view looks like on Google Street View (or see the next-to-last photo of this post). 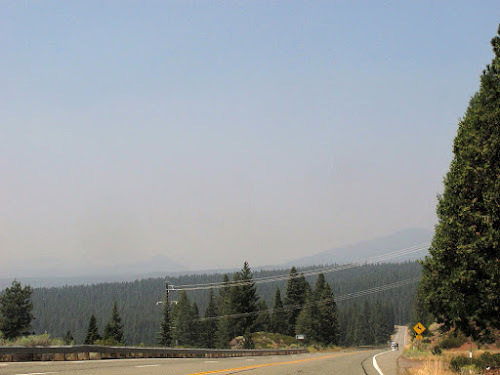 Yes, it's been very smoky in northern California this summer, as it has been in many places across the west. 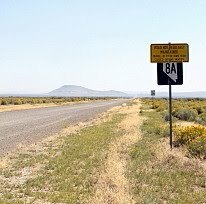 These particular photos were taken on August 21st, when I just happened to drive down the right roads in the right direction, i.e., westerly, so it was easy to notice that Lassen was essentially missing. Mt. 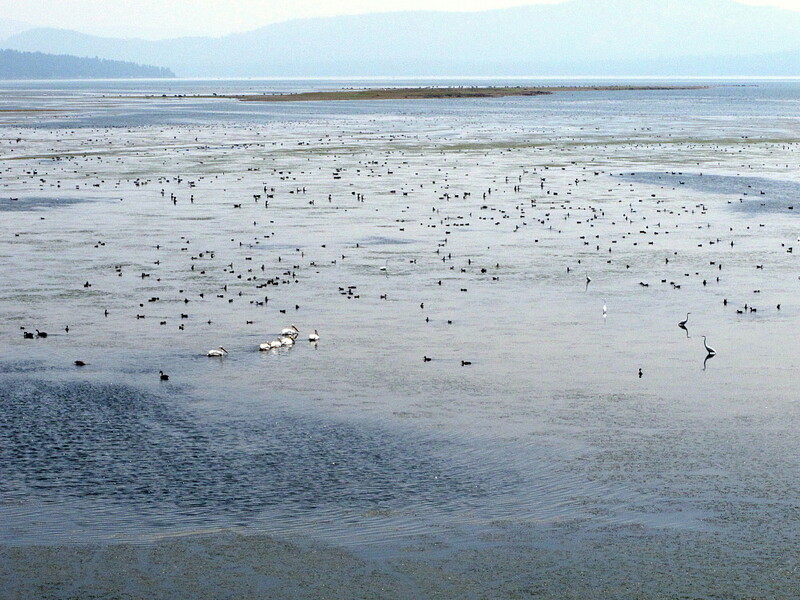 Harkness is on the far right; Kelly Mountain is a little left of center. Lassen should be where the faint smudge is in the photo above, immediately to the left of Kelly Mountain. Here, a little farther down the road, Mt. Harkness is on the horizon on the very far right, just above the highway; Kelly Mountain has disappeared below the the sloping, forested horizon. 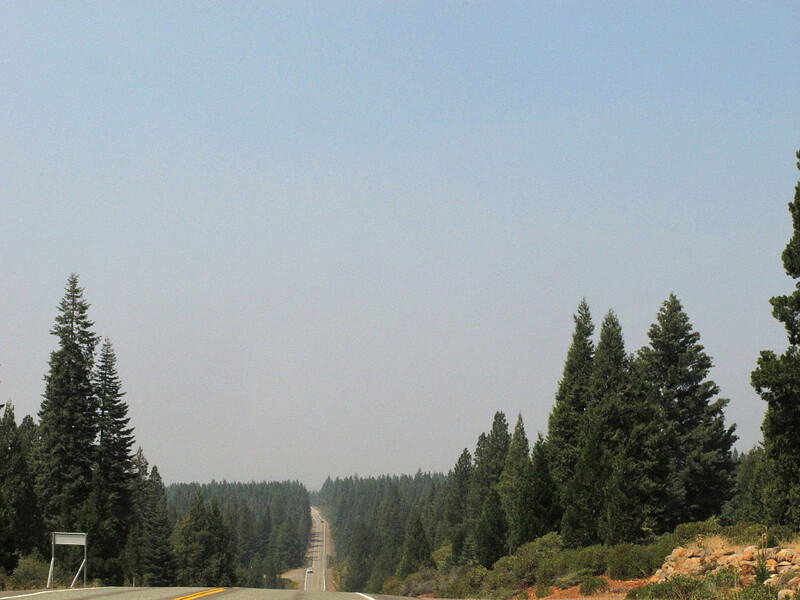 Lassen would normally be standing out just near the center of the photo (Google Street View location). 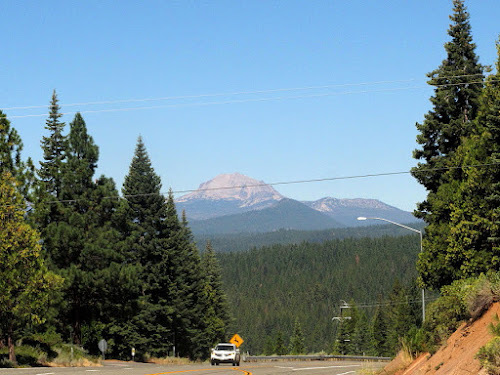 Kelly Mountain *might* be part of the far, outlying flanks of the older, larger volcano known as Mount Tehama, but *might* is a speculation on my part, one not based on much geologic research (or any mapping!). 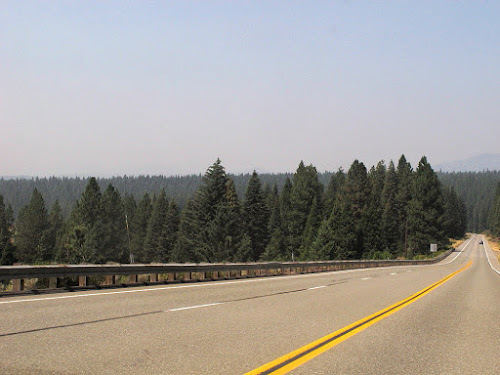 The road took me by an overlook of the northwestern end of the hazy, smoky Lake Almanor. 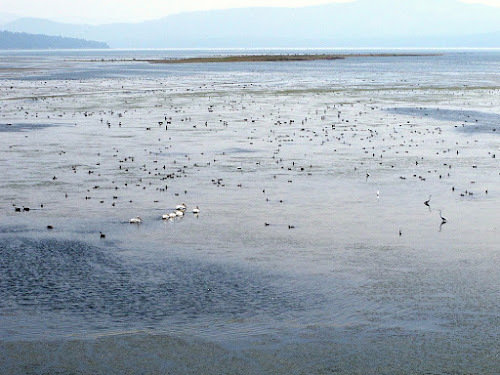 The lake is very low for this time of year; it has nevertheless been host to lots of pelicans, egrets, Canada geese, and many other waterbirds including occasional sightings of blue heron, and the often ubiquitous coots. Six pelican swim away from me above the lower left blue patch; two egrets stand like symmetrical statues toward the right. 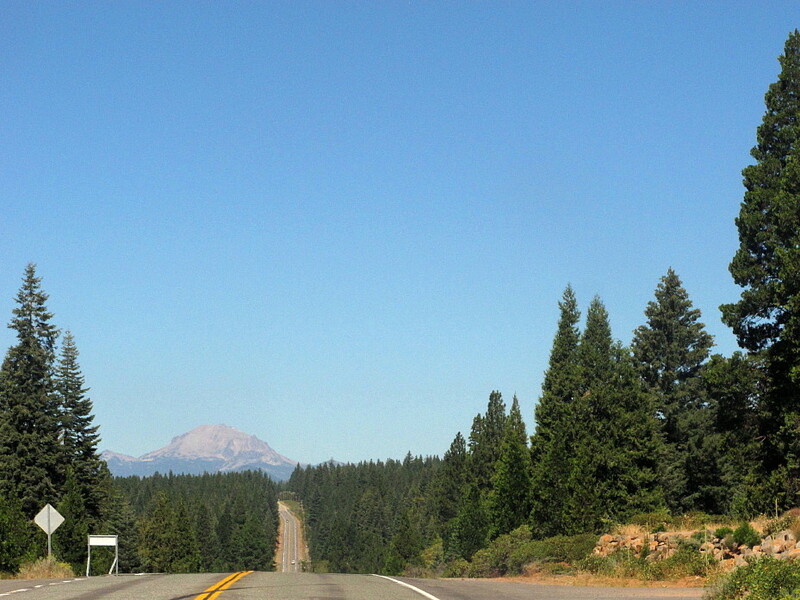 I could see Lassen Peak clearly on August 24th; the photo location approximates that of photo #1. Lassen Peak looms above the darker, tree-covered Kelly Mountain, from a location close to photo #2. This came into my playlist again (not that I really have a playlist!) when Trump decided it was an appropriate campaign song. Maybe he though it was pro-USA; who knows. It isn't, and maybe he's figured that out by now.